The price of one ounce of gold increased by 13.3195 manats or 0.6 percent last week in Azerbaijan, Trend reports. Last week in Azerbaijan, the price of one ounce of silver increased by 0.1779 manats or 0.7 percent. Accordingly, the average price of one ounce of silver stood at 26.1769 manats. Last week in Azerbaijan, the price of one ounce of platinum increased by 17.221 manats or 1.2 percent. 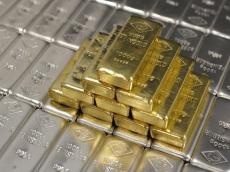 Accordingly, the average price of one ounce of platinum stood at 1,417.2645 manats. Last week in Azerbaijan, the price of one ounce of palladium increased by 58.735 manats or 2.18 percent. Accordingly, the average price of one ounce of palladium stood at 2,615.2375 manats.